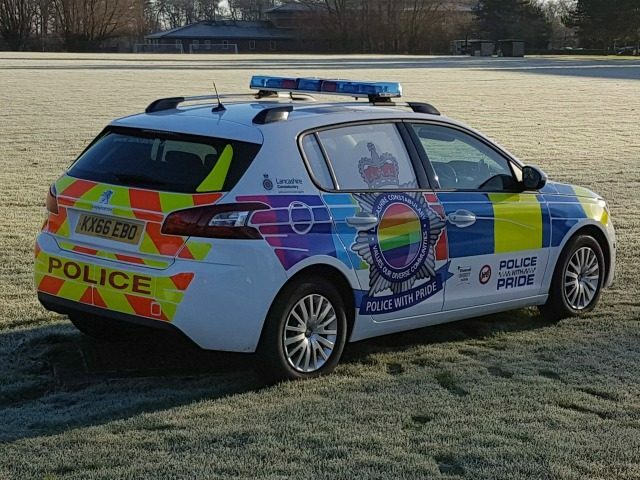 Lancashire Police has introduced a “Police with Pride” vehicle to their fleet, in the hope of encouraging more people to report ‘hate crimes’. The white and rainbow-coloured police car will be fully operational and used by the immediate response team to attend incidents around the clock across Blackpool, where it will be based. The aim of the vehicle, on which the words “Lancashire Constabulary values diverse communities” are emblazoned, is to “engage with the gay, lesbian, bisexual and trans community to raise awareness of hate crime and domestic abuse and to encourage more people to report incidents”, according to a Facebook post by Lancashire LGB&T Policing Team. It will also attend ‘Pride’ events across the region throughout the year, with Blog Preston noting that the colourful car will be making an appearance in the city for this reason in summer. Lancashire’s Deputy Chief Constable Andy Rhodes said: “We are committed to equality and valuing difference and supporting the rights of lesbian, gay, bisexual and trans people. Police and Crime Commissioner Clive Grunshaw added: “As Police and Crime Commissioner I am always looking for ways to demonstrate that the police are aware of their local communities and keen to reflect them in everything they do. Responses to the rainbow vehicle were mixed, however. “Used 24/7 by immediate response?? We all know which will be the last set of keys picked up….This rivals the ‘pumpkin patrol’ car”, Charlotte Whitton commented. It was reported on Thursday that Brighton and Hove’s former police commander, Nev Kemp, has been named Stonewall’s Senior Champion of the Year in its 2017 Workplace Equality Index. The commander’s spirited defence of an LGBT police vehicle was cited by the organisation as a key reason in their decision to issue him with the award.